Although more than half of genomic loci are believed to have antisense transcription, whether antisense transcription is involved in cytokine expression has not been studied. In this study, we show that some loci of innate immunity related genes do have antisense transcripts. We investigated the effect of several antisense RNAs, including anti–4-1BBL, anti-p100, and anti–IL-1β, on their cognate sense gene’s expression in macrophages. We found that overexpression of antisense IL-1β transcript suppressed IL-1β expression. Anti–IL-1β is complementary to the sequence in the 5′ upstream region of the IL-1β promoter. Its mediated inhibition of IL-1β production occurred at the transcriptional level. 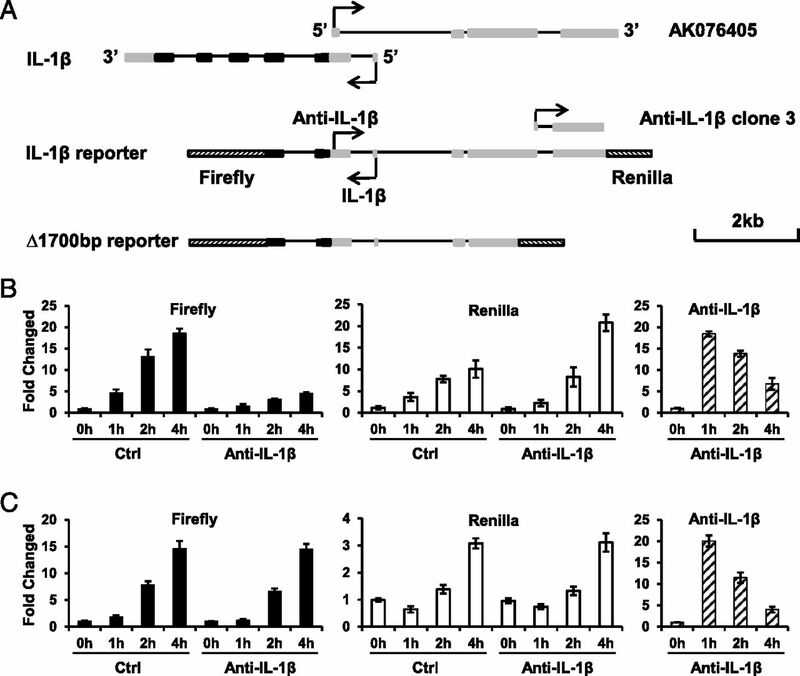 Anti–IL-1β did not alter the methylation status of the IL-1β promoter. However, chromatin immunoprecipitation assays revealed that the anti–IL-1β transcript can change the chromatin structure of the IL-1β promoter by decreasing H3K4 trimethylation on the promoter, which is at least part of the mechanism underlying the reduced binding of RNA polymerase II to the IL-1β promoter upon anti–IL-1β expression. Our data suggest that some antisense transcripts of innate immunity-related genes play a role by regulating cytokine expression. A broad definition of antisense RNA is the transcript(s) derived from any part of a gene including intron, exon, and promoter in the opposite direction of sense mRNA. Genome-wide transcriptional analyses have revealed a large amount of antisense transcription not only in repetitive regions but also in protein-coding areas. It is estimated that up to 72% of murine genomic loci showed evidence of antisense transcription (1). Although some of the antisense transcripts may represent transcription noise, there is clear evidence that many natural antisense direction transcripts play a role in gene regulation (2, 3). Genome-wide analyses suggested that natural antisense transcripts are overrepresented in certain genes such as the genes related to catalytic functions, nucleotide binding, and so on and are underrepresented in some others. The processed antisense RNA is significantly underrepresented on the mammalian X chromosome. This X chromosome bias only applies to transcript sense/antisense pairs in which there is exonic complementarity (4). These findings argue against the idea that natural antisense RNA is merely transcriptional noise or experimental artifact. Studies on selected antisense RNAs have revealed their functions in both positively and negatively regulating gene expressions. There is evidence suggesting that natural antisense RNA might function by affecting transcription (5), RNA splicing (6), RNA editing (7), or activation of PKR (8–10). It is proposed that the formation of RNA–RNA hybrids by sense and natural antisense RNA can generate “endo-small interfering RNAs” (1, 10, 11). The antisense transcripts that complement noncoding regions also affect gene expression (12). Despite the extensive data that has been accumulated, the function of the majority of these natural antisense RNAs remains obscure. Although it is anticipated that there are natural antisense RNA of immune response genes, the role of natural antisense RNA in cytokine gene expression has not been studied. Macrophages constitute the first line of host defense and participate in inflammation triggered by both exogenous and endogenous stimuli. Production of proinflammatory cytokines such as TNF-α or IL-1β is one of the most important functions of macrophages in modulating inflammation because the inflammatory cytokines are known to be involved in various acute and chronic inflammatory diseases; these include inflammatory bowel disease (13, 14), rheumatoid arthritis (15–17), and sepsis (18) among others. Bacterial endotoxin (LPS), an outer membrane component of Gram-negative bacteria and a potent activator of macrophages, triggers the abundant secretion of many cytokines from macrophages including IL-1β and TNF (19). It is known that LPS-induced cytokine expression is subject to regulation at multiple levels including at transcription, posttranscription, and translation. The involvement of transcription factors, RNA-binding proteins, and microRNA in cytokine expression has been demonstrated. However, to date, there is no report regarding to whether there is an involvement of natural antisense transcripts in cytokine expression. In this paper, we show the presence of natural antisense RNA for some innate immunity-related genes. By analyzing the effects of the expression of these antisense RNAs, we found that some of the antisense RNAs had no effect on their cognate gene’s expression, whereas others, such as IL-1β antisense transcript, suppressed their cognate gene’s expression. We further show that the suppression of IL-1β expression by antisense IL-1β is at least partially due to anti–IL-1β RNA–mediated changes of chromatin structure. RAW 264.7 cells were maintained in DMEM supplemented with 10% FBS, nonessential amino acids, and glutamine. After 48 h of transfection with linearized antisense transcripts, overexpression plasmids, and reporter plasmids, cells were selected with 800 μg/ml G418 for 6 d to set up stable overexpression lines. Primary peritoneal macrophages were prepared as described previously. Briefly, mice received i.p. injections 2 ml 3% thioglycolate 3 d before the preparation of peritoneal macrophages. After anesthesia, peritoneal macrophages were harvested from the mice by lavage of the peritoneal cavity with 5 ml saline. The cells were then washed with PBS and resuspended in DMEM supplemented with 10% FBS, glutamine, and antibiotics. After 2 h of incubation at 37°C, the nonadherent cells were removed by washing three times with PBS and cultured overnight. RNA was isolated from RAW 264.7 cells and primary peritoneal macrophages with TRIzol (Invitrogen). First-strand cDNA was synthesized with SuperScript III (Invitrogen). Relative transcript levels were measured in a duplicate set of reactions for each gene. GAPDH levels were used for normalization. Quantitative real-time PCR was performed with SYBR Green Master Mix (Applied Biosystems) on an ABI Prism 7900HT Sequence Detection System (Applied Biosystems). Data analysis was performed with the SDS software version 2.4 (Applied Biosystems). The chromatin immunoprecipitation (ChIP) kit (number 9002) was purchased from Cell Signaling Technology. ChIP was performed following the manufacturer’s instructions with control and anti–IL-1β–overexpressing RAW 264.7 cells with Abs against RNA polymerase II (Millipore), trimethylated histone H3 at lysine 4 (H3K4Me3) (Cell Signaling Technology), and trimethylated histone H3 at lysine 27 (H3K27Me3) (Cell Signaling Technology). ChIP DNA was analyzed with SYBR Green MasterMix (Applied Biosystems) on an ABI Prism 7900HT Sequence Detection System (Applied Biosystems). Data analysis was performed using the SDS software version 2.4 (Applied Biosystems). DNA methylation analysis was performed following the manufacturer’s instructions using the EZ DNA methylation-gold kit (ZYMO Research). Genomic DNA (100 ng) from control and anti–IL-1β overexpression cells was applied for the assay. Converted DNA was used for PCR amplification. PCR products were cloned and sequenced. RAW 264.7 cells were pretreated with 10 ng/ml LPS for 4 h, followed by treatment with 50 μg/ml actinomycin D. Total RNA was extracted with TRIzol reagent and reverse transcripted into cDNA. IL-1β and TNF-α cDNAs were quantitated by real-time PCR. Anti–IL-1β was cloned into pT7CFE1-CHis vector. The in vitro translation assay was performed following the manufacturer’s instructions (number 88855; Pierce). Briefly, 1 μg linearized plasmid was used as the template to transcribe mRNA with T7 RNA polymerase. Transcription products were translated with [35S]methionine containing amino acid mixture for protein expression at 30°C for 90 min. Translation products were analyzed by SDS-PAGE. According to the manufacturer’s protocol, 200 ng total RNA was used for reverse transcription. A final concentration of 2.5 μM oligo(dT)16 primer and 200 nM forward- or reverse-strand primer was used to synthesize the first-strand cDNA with the SuperScript III (Invitrogen). Relative transcript levels were measured in a duplicate set of reactions for each gene. The list of antisense transcripts may be found at http://genome.gsc.riken.go.jp/m/antisense/viewer/, and the Genome Browser is located at http://genome.ucsc.edu/. To get an overall idea of the expression of antisense RNAs that relate to innate immune responses, we searched the FANTOM2 database (4) for 216 genes that are involved in innate immune reactions; we found 27 natural antisense transcripts (Table I). The genes that have antisense RNA include cytokines (IL-1α, IL-1β, IL-18, IFN-γ, and so on), receptors (IL-6rα, IL-1r2, IL-20rα, and so on), and signal transduction genes (IRF1, Traf5, Tirap, p100, p105, and so on). We did not find antisense transcripts of MyD88, IRAK1/4, CD14, and MD2, which are known to be important in innate immunity. Although we cannot exclude the possibility that their antisense transcripts have not yet been identified, based on current studies in natural antisense RNA, we believe that as with the genes involved in other biological processes, only a fraction of the innate immunity-related genes have antisense transcripts. To gain a better understanding of antisense RNA in innate immunity, we chose six antisense transcripts, anti–IL-1α, anti–IL-1β, anti–4-1BBL, anti–IL-4i1, anti-p100, and anti-p105, for further analysis. The University of California Santa Cruz Genome Browser was used to plot the loci of these sense–antisense pairs of genes and revealed that these antisense transcripts can be divided into two groups according to the classification by Werner et al. (Supplemental Fig. 1) (1). One is head-to-head (Supplemental Fig. 1A); their overlap is in the 5′ region of the genes. The other is tail-to-tail (Supplemental Fig. 1B); they overlap in the 3′ region of the genes. Primers were designed based on this information to specifically detect expression of these antisense RNAs in macrophage cell line RAW264.7 and peritoneal macrophages. Because LPS activation of macrophages is a model cell system to innate immune responses, we treated RAW264.7 cells with LPS for different periods of time and measured the above mentioned six antisense RNAs by real-time PCR. As shown in Fig. 1A, LPS stimulation reduced the level of anti–4-1BBL but increased the expression of the other five antisense transcripts to different extents. As previously reported, the expression of all of the six sense genes were induced to different levels by LPS stimulation (20–24). Similar results were obtained when the expression of these antisense RNAs were analyzed using murine primary peritoneal macrophages (Fig. 1B). It needs to be noted that the expression levels of the sense transcripts are much higher than the antisense transcripts. The expression of sense and antisense transcripts decreased in similarly at a later time (6–24 h) of LPS stimulation (data not shown). In short, we confirmed the presence of anti–IL-1α, anti–IL-1β, anti–4-1BBL, anti–IL-4i1, anti-p100, and anti-p105 transcripts in macrophages and found that their expression is dynamically regulated during LPS-induced macrophage activation. Antisense transcripts were induced by LPS in both RAW 264.7 cells and primary peritoneal macrophages. (A) Sense and antisense transcript expression in LPS-stimulated RAW 264.7 cells. RAW 264.7 cells were treated with 100vng/ml LPS from 0 to 6 h. Total RNA was extracted for real-time qPCR. 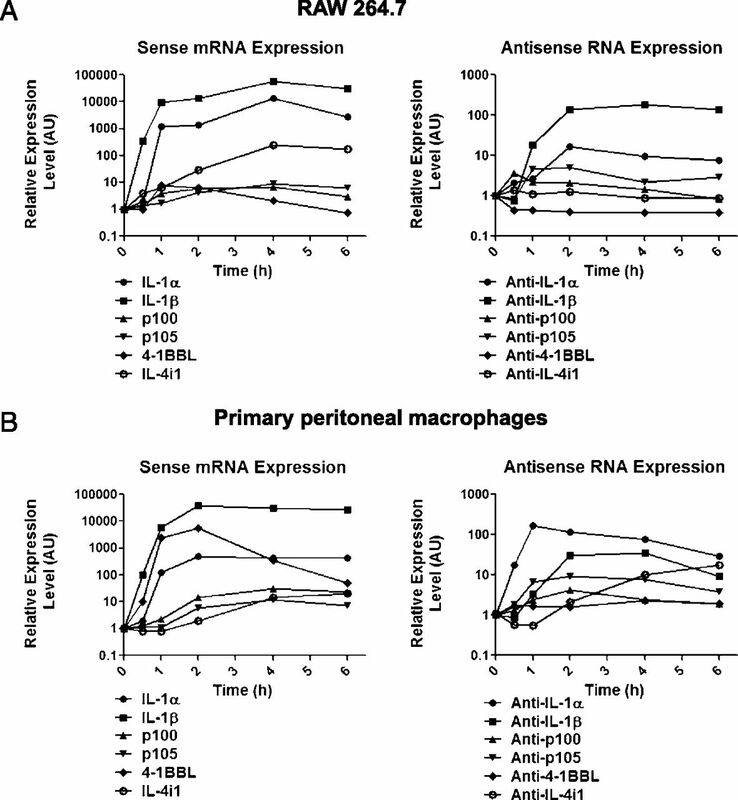 (B) Sense and antisense transcript expression in LPS-stimulated primary peritoneal macrophages. Cells were treated as in (A). All values are represented as mean from triplicated samples (n = 3), and all samples at time 0 are set to relative abundance of 1. One representative experiment out of three is shown. To further study the function of antisense RNA in LPS-induced macrophage activation, we chose highly induced anti–IL-1β, moderately induced anti-p100, and suppressed anti–4-1BBL for further study. All of these three antisense RNAs are head-to-head type (Supplemental Fig. 1). To specifically study these antisense transcripts in RAW 264.7 cells, we cloned anti–IL-1β, anti-p100, and anti–4-1BBL from this cell line. 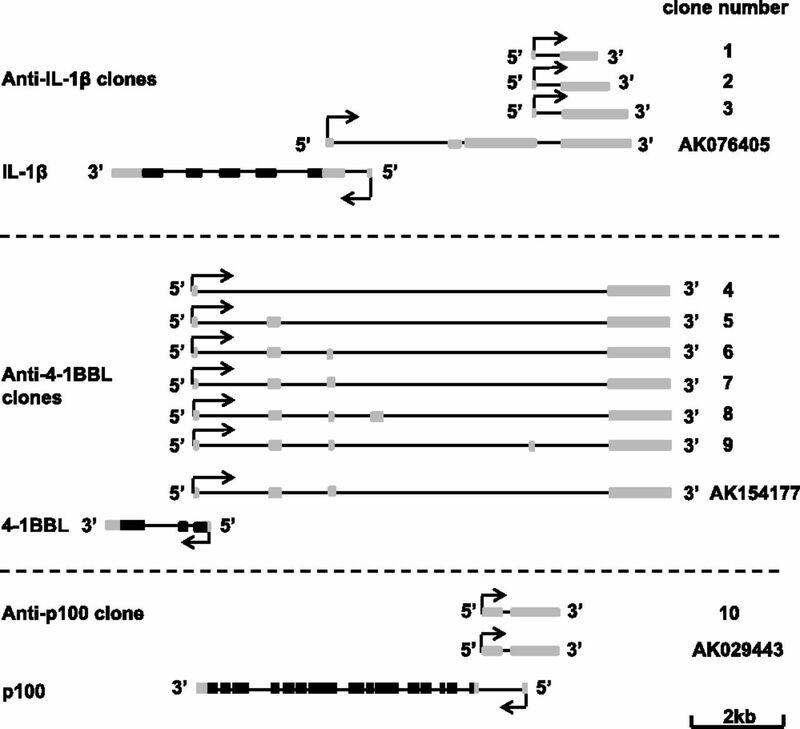 The anti–IL-1β transcripts we cloned are varied in length and shorter than the sequence in the database (named AK076405) (Fig. 2). Multiple attempts did not add more antisense transcripts than those shown in Fig. 2. Northern blot analysis only detected smeared signals but not bands (data not shown), suggesting that the antisense transcripts might be heterogeneous in length. The sequence alignment of our longest anti–IL-1β cDNA (clone 3; Fig. 2) with AK076405 and IL-1β genome is shown in Supplemental Fig. 2. We used our longest anti–IL-1β transcript for further study. The anti–4-1BBL transcripts we cloned are similar to the sequence in the database, except that six different splicing forms were isolated in our experiments. We chose to use the transcript that has the same sequence as that in the database for further study (clone 7; Fig. 2). The anti-p100 we cloned is the same as that in the database (clone 10; Fig. 2). Schematic of anti–IL-1β, anti–4-1BBL, and anti-p100 clones and their annotated expressed sequence tags in GenBank. Lines represent gene loci; black boxes represent coding region; gray boxes represent noncoding region. We subcloned the abovementioned three antisense transcripts (cDNA) under the control of elongation factor-1 α (EF1α) promoter and transfected them into RAW264.7 cells to establish stable cell lines. The EF1α promoter was chosen because its responsiveness to LPS is less than the more commonly used CMV and SV40 promoters in RAW264.7 cells (data not shown). The pool and individual cell lines were isolated and characterized for their expression of the transfected antisense RNA. Because the expression levels of these antisense RNAs in the individual clones and the pools are similar, we used pools to conduct experiments. It was reported that antisense transcripts can affect the expression of sense genes. So we determined whether the overexpression of antisense transcripts influenced LPS-induced induction of endogenous sense genes. Despite of the use of EF1α promoter, the exogenously introduced antisense transcripts were still induced to various extents by LPS treatment (right panels of Fig. 3). These exogenous antisense transcripts were expressed at much higher levels than the endogenous antisense transcripts, and thus, it is the result of overexpression that should be observed in these experiments. Fig. 3A shows that RAW264.7 cells transfected with empty vector or anti–4-1BBL–expressing vector had comparable expression of 4-1BBL sense RNA, although much more anti–4-1BBL RNA was detected in the cells transfected with the anti–4-1BBL–expressing vector. Similarly, expression of anti-p100 had no significant effect on the induction of p100 after LPS treatment (Fig. 3B). In contrast, expression of anti–IL-1β significantly reduced LPS-induced IL-1β expression at both time points (Fig. 3C). As controls, overexpression of anti–4-1BBL or complementary strand of anti–IL-1β did not affect IL-1β expression (Supplemental Fig. 3). These data indicate that different antisense RNAs had different effects on the expression of their sense transcripts. It needs to be noted that the anti–IL-1β we overexpressed is situated ∼3 kb away from the sense transcription unit. Its ability to regulate sense transcription from such a long distance is not a surprise because regulatory elements of a given gene can be dispersed far away, even hundreds of kilobases, from the transcriptional initiation site (25, 26). Overexpression of anti–IL-1β suppressed the induction of IL-1β triggered by LPS. (A) Effect of anti–4-1BBL on LPS induced 4-1BBL expression. RAW 264.7 cells were transfected with anti–4-1BBL overexpression vector and selected as a stable line. After the treatment of LPS, total RNA was extracted, reverse transcribed to cDNA, and applied to real-time quantitative PCR. The expression levels of 4-1BBL and total anti–4-1BBL were converted to absolute units and normalized to GAPDH expression. The relative RNA levels were obtained by setting the control samples at time 0 as abundance of 1. Data are the mean ± SEM of triplicates. (B) Effect of anti-p100 on LPS-induced p100 expression. Samples collected and data presented as in (A). (C) Effect of anti–IL-1β on LPS-induced IL-1β expression. Samples collected and data presented as in (A). AU, absorbance unit. We then characterized anti–IL-1β RNA in RAW264.7 cells. We found that only oligo d(T) primer and reverse primer but not the forward primer of anti–IL-1β can reverse transcribe anti–IL-1β RNA, indicating it is a poly(A) RNA (Supplemental Fig. 4A). By extracting cytosolic and nuclear RNA, we found that anti–IL-1β RNA was primarily located in the nuclei of RAW264.7 cells (Supplemental Fig. 4B). Furthermore, by using an in vitro translation system, we determined that anti–IL-1β RNA cannot translate into protein (Supplemental Fig. 4C). Thus, anti–IL-1β RNA is a noncoding nuclear poly(A) RNA. The anti–IL-1β and IL-1β mRNA are in head-to-head position (Fig. 2). The anti–IL-1β overlaps with 5′ upstream promoter region of IL-1β gene, suggesting that the promoters of the two directional transcriptions at IL-1β locus are located at the same or nearby genomic fragments. We constructed a reporter gene termed IL-1β reporter using an ∼8-kb IL-1β genome fragment containing part of IL-1β coding region, promoter, and the 5′ upstream region corresponding to antisense transcript (Fig. 4A). Firefly luciferase gene with a poly(A) signal sequence was linked to the second exon of IL-1β gene in the direction of IL-1β transcription. Renilla luciferase gene with a poly(A) signal sequence was added after anti–IL-1β in anti–IL-1β direction (Fig. 4A). The reporter was stably transfected into RAW264.7 cells with the anti–IL-1β expression plasmid or empty vector (control). The cells were treated with LPS for different periods of time, and the luciferase activities were determined. As shown in Fig. 4B, both firefly and renilla luciferase activities were induced by LPS stimulation, indicating that the reporter mimicked endogenous IL-1β gene in the bidirectional transcription. We estimated by quantitative RT-PCR that the antisense transcription level is approximately one-tenth of sense transcription (data not shown), which is a ratio similar to the ratio of the expression of endogenous antisense IL-1β RNA to that of antisense IL-1β mRNA (Fig. 1). As with the endogenous IL-1β (Fig. 3C), the LPS-induced firefly luciferase expression was inhibited by anti–IL-1β expression (Fig. 4B, left panel). In contrast, the anti–IL-1β expression did not inhibit but even enhanced LPS-induced renilla luciferase expression (Fig. 4B, central panel). These results were reproducible when independently generated stable reporter cell lines were used. This different effect of anti–IL-1β on the two directions of gene transcription is unlikely to result from a particular locus of reporter gene insertion site because we used pools of the stably transfected cells. Different effects of anti–IL-1β overexpression on sense and antisense transcription in IL-1β locus. (A) Schematic of the reporters of bidirectional transcription. (B) The RAW264.7 cells, stably transfected with a bidirection reporter (IL-1β reporter) together with empty vector (Ctrl) or anti–IL-1β overexpression vector, were treated with LPS for different times as indicated. The sense expressions were determined by measuring firefly luciferase activity, and the antisense expressions were determined by measuring renilla luciferase activity. The expression levels of exogenously introduced anti–IL-1β were determined by quantitative PCR. (C) The same as in (B), except that ∆1700 reporter was used. Because the reporter contains the anti–IL-1β sequence, we used one primer located in the flanking sequence derived from the anti–IL-1β expression vector to specifically measure exogenously introduced anti–IL-1β transcript. We did not detect exogenous anti–IL-1β in control cells and detected anti–IL-1β in anti–IL-1β–transfected cells (Fig. 4B, right panel). Similar to the data shown in Fig. 3C, EF1α-driven anti–IL-1β expression was induced by LPS stimulation. We also constructed an IL-1β reporter termed ∆1700 reporter, in which the 1700-bp sequence corresponding to anti–IL-1β was deleted (Fig. 4A). ∆1700 reporter was stably transfected into RAW264.7 cells with the anti–IL-1β expression plasmid or empty vector (control). The expression of anti–IL-1β did not inhibit LPS-induced firefly and renilla luciferase expression (Fig. 4C), suggesting that the suppression of IL-1β expression by anti–IL-1β depends on its homologous sequence in the IL-1β promoter. As noted earlier, the anti–IL-1β RNA derives from the promoter region of IL-1β (Fig. 2). Thus, it cannot form RNA–RNA hybrids with IL-1β mRNA, and therefore, generating “endo-small interfering RNA” is clearly not the mechanism by which anti–IL-1β functions. We constructed vectors to express three different truncations of anti–IL-1β to determine whether any subregion of this RNA plays a key role in suppression of IL-1β expression. The expression of these deletion mutants was measured using two sets of primers as shown in Fig. 5A. Inhibition of IL-1β expression was observed in the cells expressing any one of these three deletions (Fig. 5B), suggesting that all sequences in the anti–IL-1β RNA can affect IL-1β expression. However, the levels of inhibition by anti–IL-1β and its deletions were not correlated with their expression level (Fig. 5B, 5C), suggesting that some sequences in the anti–IL-1β RNA may have stronger inhibitory effects than others. 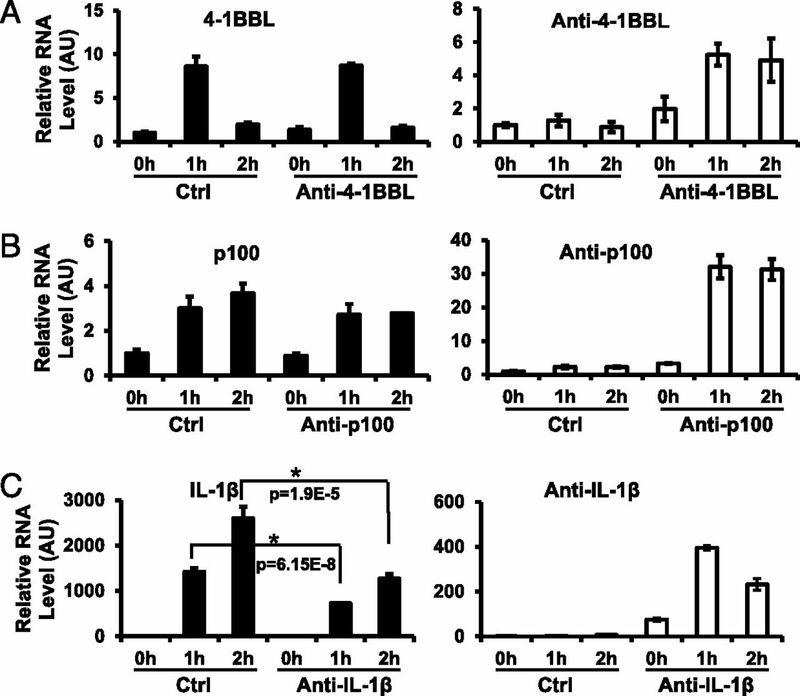 All parts of anti–IL-1β are important for its suppression effect on IL-1β expression. (A) Schematic of anti–IL-1β mutants and primer sets. Anti–IL-1β (1–231) has the sequence from 1 to 231 bp of anti–IL-1β. Anti–IL-1β (1–470) has the sequence from 1 to 470 bp of anti–IL-1β. Anti–IL-1β (231-726) has the sequence from 231 to 726 bp of anti–IL-1β. Primer set A was designed for anti–IL-1β (1–231)/(1–470), set B was designed for anti–IL-1β (231–726) only. (B) Effect of anti–IL-1β mutants on IL-1β induction. Stable cell lines of control, anti–IL-1β, and the three mutants were treated with LPS for 6 h. IL-1β mRNA expression was determined by real-time quantitative PCR. (C) Expression of the three anti–IL-1β mutants. Primer sets A and B were used to determine the expression of the mutants. All values were represented as mean ± SEM from triplicated samples (n = 3). One representative experiment out of three is shown. Antisense transcripts has been reported to influence sense mRNA stability. Inducible NO synthase mRNA can be stabilized by its antisense RNA (27). Although anti–IL-1β is unlikely to pair with IL-1β mRNA because it is located in the promoter region of IL-1β (Fig. 2), whether it has an effect on the stability of IL-1β still needed to be determined. We pretreated RAW264.7 cells with 10 ng/ml LPS for 4 h, followed by 50 μg/ml actinomycin D treatment. Total RNA was collected from 0 to 3 h after actinomycin D treatment. The stability of IL-1β mRNA was compared between control and anti–IL-1β–overexpressing RAW 264.7 cells. The stability of TNF mRNA was also measured and included as a control. The stability of IL-1β mRNA is very similar in vector and anti–IL-1β–expressing lines (Fig. 6A). As expected, TNF mRNA stability was not affected by anti–IL-1β expression (Fig. 6B). The higher anti–IL-1β level in the overexpressing cell line was confirmed (Fig. 6C). These results demonstrated that anti–IL-1β has no effect on IL-1β mRNA stability. Overexpression of anti–IL-1β has no effect on IL-1β mRNA stability. RAW 264.7 cells were stimulated with LPS for 4 h, followed by 50 μg/ml actinomycin D treatment. Total RNA was extracted for real-time PCR. IL-1β (A) and TNF-α (B) degradation and anti–IL-1β (C) overexpression were determined by real-time quantitative PCR. RNA polymerase II is the enzyme responsible for the transcription of protein-coding genes. The binding ability of this enzyme to the promoter would be increased when gene expression is activated. To determine whether anti–IL-1β–mediated inhibition of IL-1β mRNA expression occurred at transcriptional level, we measured binding of RNA polymerase II to the transcription start site of IL-1β. ChIP assay showed that the binding of RNA polymerase II at the IL-1β transcription start site was decreased in anti–IL-1β–overexpressing cells (Fig. 7A). 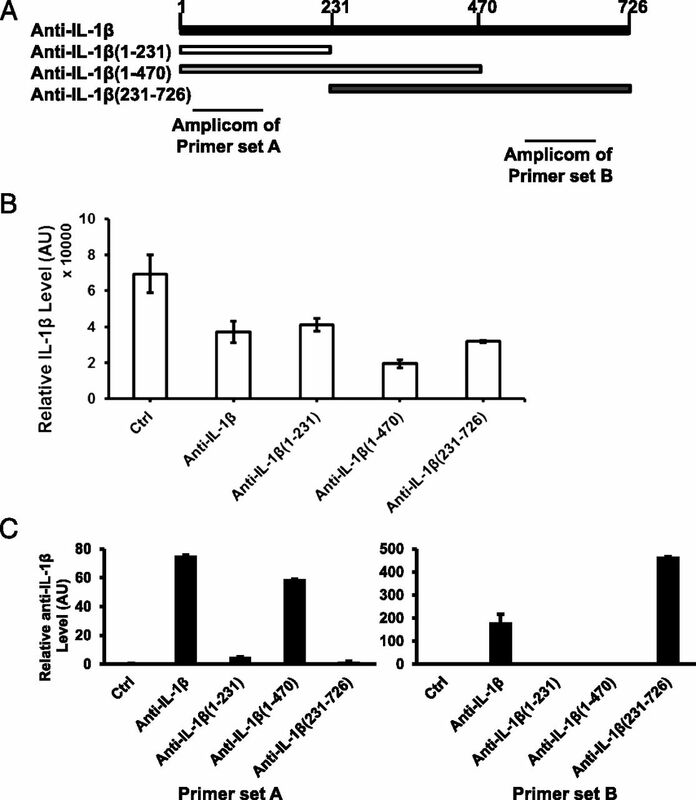 ChIP assay with anti–IL-1β intron region showed no difference between vector and anti–IL-1β–transfected cells (Fig. 7B), confirming a specific inhibitory effect of anti–IL-1β RNA on the transcription of IL-1β. Anti–IL-1β leads to modification IL-1β chromatin structure. (A) Overexpression of anti–IL-1β decreased recruitment of RNA polymerase II to the IL-1β transcription start region. Genomic DNA was pulled down by anti-RNA polymerase II Ab and quantitated by real-time qPCR with the primers specific to the IL-1β transcription start region. The amount of DNA determined by quantitative PCR is plotted. (B) Anti–IL-1β has no effect on the binding of RNA polymerase II to the anti–IL-1β intronic region. Samples were collected as in (A) and quantitated by quantitative PCR with anti–IL-1β intron–specific primers. All values were represented as mean ± SEM from triplicated samples (n = 3). (C) Schematic of IL-1β promoter region. ●, CpG sites; ▪, the start of the IL-1β mRNA. Anti–IL-1β overexpression did not lead to CpG methylation change at these sites. (D) Anti–IL-1β reduced H3K4Me3 bound to the IL-1β promoter. Genomic DNA, pulled down with anti-H3K4Me3 Ab from control and anti–IL-1β overexpression cell lines, were analyzed by real-time PCR analysis to quantitate the IL-1β promoter (−1 to −150) and intronic DNA. (E) H3K27Me3 levels were not affected by anti–IL-1β overexpression. Genomic DNA was pull down as in (D) with H3K27Me3 Ab. All values were represented as mean ± SEM from triplicated samples (n = 3). One representative experiment out of three is shown. *p < 0.05 compared with respective control value. Because DNA methylation plays an important role in gene expression, we examined whether anti–IL-1β affected the methylation status of the IL-1β promoter. To investigate this possibility, we analyzed the methylation of the IL-1β promoter. There are five CpG sites in the −1 to −500 region of IL-1β promoter, and one at the transcription start site (Fig. 7C, ●). Sodium bisulfite converts cytosines in RNA to uracil, whereas methylation on cytosines prevents this conversion (28). By treating the DNA sample with sodium bisulfite, amplifying with PCR and sequencing, the methylation of CpG was determined. We found that CpG sites at −406, −372, and −355 were always methylated, but the sites at −248, −234, and +1 were not methylated (Fig. 7C). No difference of the methylation was found between control and anti–IL-1β–expressing RAW 264.7 cells. In LPS-treated samples, we found that 17% of the CpG at −372 was unmethylated in control cells and 10% of the CpG site at +1 was methylated in anti–IL-1β overexpression cells (Fig. 7C). Because there was only a very slight difference of CpG methylation between control and anti–IL-1β overexpression cells, we conclude that DNA methylation is unlikely to play a key role in anti–IL-1β–mediated suppression of IL-1β expression. Histone H3 is a component of nucleosomes. The amino acid tail of histone H3 can be methylated, acetylated, phosphorylated, and ubiquitinated. These modifications affect chromatin structure and thus regulate gene expression (29). It is known that H3K4Me3 is enriched on highly activated promoters (30), and H3K27Me3 is associated with low expression promoters (31). We used ChIP assay to investigate histone 3 modifications in the IL-1β promoter region (−1 to −150). IL-1β intron was included as a control. As shown in Fig. 7D, LPS stimulation dramatically enriched H3K4Me3 (from 0.73 to 8.2%) at IL-1β promoter region, which is consistent with IL-1β mRNA induction (Fig. 3C). In the resting stage (no LPS stimulation), H3K4Me3 at IL-1β promoter was not different between control and anti–IL-1β overexpression cells. In contrast, following LPS stimulation anti–IL-1β overexpression significantly reduced H3K4Me3 at IL-1β promoter. 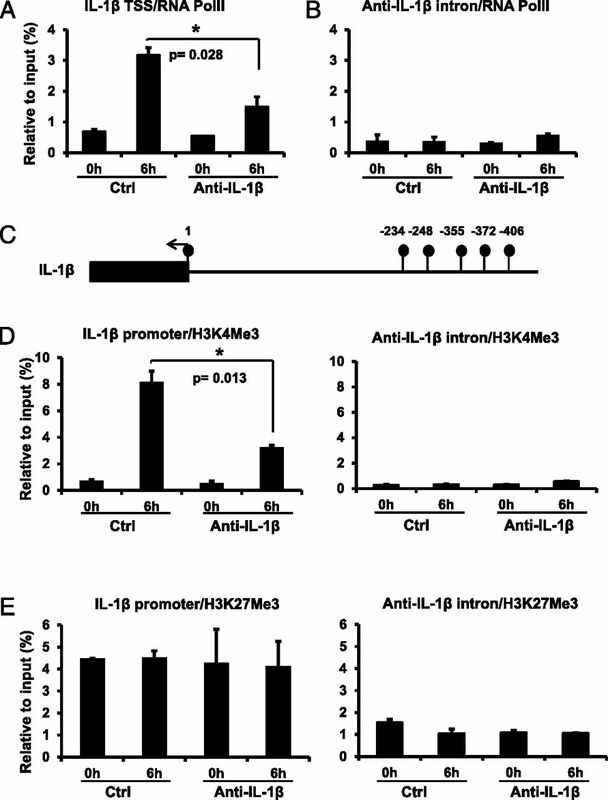 The anti–IL-1β–mediated reduction of H3K4Me3 at IL-1β promoter correlated with inhibition of IL-1β mRNA expression (Figs. 3C, 7D). We also measured H3K27Me3 on IL-1β promoter and found that neither LPS treatment nor anti–IL-1β overexpression had an effect on the level of H3K27Me3 at IL-1β promoter (Fig. 7E). These results indicate that inhibition of H3K4 trimethylation on IL-1β promoter is at least part of the mechanism by which anti–IL-1β–mediated suppression of IL-1β gene expression. Inflammatory cytokine expression is known to be controlled at multiple levels. We show in this paper that the antisense transcript of IL-1β may add one more layer of control to IL-1β expression. Overexpressed anti–IL-1β has an inhibitory effect on LPS-induced IL-1β expression. We found that at least one of the effects of the anti–IL-1β is to inhibit LPS-induced trimethylation of H3K4 bound to the IL-1β promoter, thus reducing LPS-induced IL-1β transcription. Anti–IL-1β RNA appears to have splicing variants because the anti–IL-1β RNAs we cloned have different lengths and are also different from the anti–IL-1β sequence in the database. Because we were unable to clone the same anti–IL-1β as that in the database, it is possible that different anti–IL-1β RNAs are transcribed in different types of cells. Although we show in this paper that anti–IL-1β can alter H3K4 trimethylation in the IL-1β promoter, we cannot exclude the possibility that an anti–IL-1β with a different length, such as that deposited in the database, might have a different function or functions. Because anti–IL-1β was expressed at a much lower level than IL-1β mRNA, whether it would have measurable effect on sense transcription in vivo cannot be assessed by current techniques. However, the low level of anti–IL-1β might not limit its function in modulating H3K4 trimethylation because targeting genomic DNA may not need many RNA molecules. For example, if anti–IL-1β activates demethylation of H3K4Me3, its effect could be catalytic rather than stoichiometric. The expression of anti–IL-1β RNA is associated with the activation of sense transcription because the induction of anti–IL-1β by LPS stimulation has similar kinetics to that of IL-1β sense transcription (Fig. 1). However, the promoter elements that control the transcriptions in the two directions should not all be the same because the anti–IL-1β has different effects on sense and antisense transcriptions (Fig. 4B). Probably H3K4Me3 only affects nearby transcriptional initiation, and H3K4 trimethylation near the initiation site of IL-1β mRNA only reduces IL-1β transcription but not anti–IL-1β transcription. Our data presented in this paper demonstrate that overexpressed anti–IL-1β can inhibit H3K4 trimethylation in the IL-1β promoter. The chromatin modification suggests that anti–IL-1β functions by targeting the DNA of the IL-1β promoter. This notion is supported by the fact that the sequence of anti–IL-1β is derived from the 5′ upstream sequence of the IL-1β promoter, and anti–IL-1β transcripts are located in the nucleus. Small interfering RNA or antisense non-coding RNA–mediated chromatin remodeling has been reported previously (32, 33). In this paper, we provide another example where antisense RNA plays a role in modifying chromatin. Because pairing with the sequence of the IL-1β 5′ upstream region of its promoter should be the mechanism for anti–IL-1β to specifically regulate IL-1β promoter, how RNA interacts with genomic DNA is still an open question. It is highly possible that anti–IL-1β interacts with the sense strand of the IL-1β promoter immediately after it is transcribed because unwinding dsDNA in the IL-1β promoter region is required for it to pair with anti–IL-1β RNA. Nuclear RNA and promoter interaction could be a very important regulatory mechanism of gene expression. Because of the essential role of IL-1β in inflammation, we expect that suppression of IL-1β by anti–IL-1β should affect inflammatory responses in vivo. Although no data are available regarding to the involvement of natural antisense RNA in inflammation, the involvement of antisense RNA in other diseases have been reported. Span et al. (34) reported recently that overexpression of a natural antisense transcript of hypoxia-inducible factor 1 (αHIF) is associated with malignant pheochromocytoma/paraganglioma. Differential expression of hundreds of antisense RNAs between colorectal cancer tissues and noncancerous tissues was also reported recently (35). It will not be a surprise whether alteration of antisense expression affects inflammatory responses. In summary, we have analyzed a number of antisense transcripts of innate immune response genes. Diversities can be found in these transcripts in terms of complementarity regions (coding, noncoding, promoter, and intron/exon) and effects on sense transcripts. We show that the anti–IL-1β transcript, which should target the promoter region of IL-1β, can suppress IL-1β transcription by modifying the chromatin structure of the IL-1β promoter. Our data suggest that interaction of a nuclear RNA with a promoter is a mechanism that regulates gene expression. ↵1 J.L. and X.W. contributed equally to this work. This work was supported by National Science Foundation China Grants 91029304, 81061160512, 31221065, and 91229201 and National Institutes of Health Grants AI41637 and AI68896. trimethylated histone H3 at lysine 27.
. 2009. What do natural antisense transcripts regulate? RNA Biol. 6: 43–48.
. 2009. Wrap53, a natural p53 antisense transcript required for p53 induction upon DNA damage. Mol. Cell 33: 462–471.
. 2007. Hypoxia-inducible expression of a natural cis-antisense transcript inhibits endothelial nitric-oxide synthase. J. Biol. Chem. 282: 15652–15666. Kiyosawa, H., I. Yamanaka, N. Osato, S. Kondo, Y. Hayashizaki, RIKEN GER Group, and GSL Members. 2003. Antisense transcripts with FANTOM2 clone set and their implications for gene regulation. Genome Res. 13(6B): 1324–1334.
. 2005. Transcriptional interference—a crash course. Trends Genet. 21: 339–345.
. 2003. aHIF but not HIF-1α transcript is a poor prognostic marker in human breast cancer. Breast Cancer Res. 5: R223–R230.
. 2001. The fate of dsRNA in the nucleus: a p54(nrb)-containing complex mediates the nuclear retention of promiscuously A-to-I edited RNAs. Cell 106: 465–475.
. 2001. Chemistry and biochemistry of 2′,5′-oligoadenylate-based antisense strategy. Curr. Med. Chem. 8: 1189–1212.
. 2004. Effects of length and location on the cellular response to double-stranded RNA. Microbiol. Mol. Biol. Rev. 68: 432–452.
. 2008. Processing of naturally occurring sense/antisense transcripts of the vertebrate Slc34a gene into short RNAs. Physiol. Genomics 34: 95–100.
. 2008. Endogenous siRNAs from naturally formed dsRNAs regulate transcripts in mouse oocytes. Nature 453: 539–543.
. 2009. Regulatory roles of natural antisense transcripts. Nat. Rev. Mol. Cell Biol. 10: 637–643.
. 1999. Impaired on/off regulation of TNF biosynthesis in mice lacking TNF AU-rich elements: implications for joint and gut-associated immunopathologies. Immunity 10: 387–398.
. 1990. Role of interleukin 1 in inflammatory bowel disease—enhanced production during active disease. Gut 31: 686–689.
. 1996. Role of cytokines in rheumatoid arthritis. Annu. Rev. Immunol. 14: 397–440.
. 1996. Attenuation of collagen-induced arthritis in 55-kDa TNF receptor type 1 (TNFR1)-IgG1-treated and TNFR1-deficient mice. J. Immunol. 157: 3178–3182.
. 1998. Different roles of tumour necrosis factor α and interleukin 1 in murine streptococcal cell wall arthritis. Cytokine 10: 690–702.
. 1993. Anticytokine strategies in the treatment of the systemic inflammatory response syndrome. JAMA 269: 1829–1835.
. 2001. LPS induction of gene expression in human monocytes. Cell. Signal. 13: 85–94.
. 2007. Cell surface 4-1BBL mediates sequential signaling pathways ‘downstream’ of TLR and is required for sustained TNF production in macrophages. Nat. Immunol. 8: 601–609.
. 2008. P2X7 receptor differentially couples to distinct release pathways for IL-1beta in mouse macrophage. J. Immunol. 180: 7147–7157.
. 1998. Regulation of p100 (NFKB2) expression in human monocytes in response to inflammatory mediators and lymphokines. Leukemia 12: 363–370.
. 2010. p52-Independent nuclear translocation of RelB promotes LPS-induced attachment. Biochem. Biophys. Res. Commun. 391: 235–241.
. 2011. Myeloid-specific GPCR kinase-2 negatively regulates NF-κB1p105-ERK pathway and limits endotoxemic shock in mice. J. Cell. Physiol. 226: 627–637.
. 2005. Remote control of gene transcription. Hum. Mol. Genet. 14(Spec No 1): R101–R111.
. 2005. Long-range control of gene expression: emerging mechanisms and disruption in disease. Am. J. Hum. Genet. 76: 8–32.
. 2008. Natural antisense transcript stabilizes inducible nitric oxide synthase messenger RNA in rat hepatocytes. Hepatology 47: 686–697.
. 1992. A genomic sequencing protocol that yields a positive display of 5-methylcytosine residues in individual DNA strands. Proc. Natl. Acad. Sci. USA 89: 1827–1831.
. 2005. Taking LSD 1 to a new high. Cell 122: 654–658.
. 2007. The landscape of histone modifications across 1% of the human genome in five human cell lines. Genome Res. 17: 691–707.
. 2007. High-resolution profiling of histone methylations in the human genome. Cell 129: 823–837.
. 2010. Transcriptional gene silencing through epigenetic changes mediated by non-coding RNAs. Curr. Opin. Mol. Ther. 12: 214–222.
. 2009. Reconstruction of Arabidopsis thaliana fully integrated small RNA pathway. Funct. Integr. Genomics 9: 419–432.
. 2011. Overexpression of the natural antisense hypoxia-inducible factor-1α transcript is associated with malignant pheochromocytoma/paraganglioma. Endocr. Relat. Cancer 18: 323–331.
. 2010. Identification of natural antisense transcripts involved in human colorectal cancer development. Int. J. Oncol. 37: 1425–1432.